When asked to measure her years of supporting Melbourne Theatre Company, Sandra Beanham – like many long-time subscribers of the Company – could only take a guess at the number of years she’d been attending MTC plays; somewhere around the four-decade mark she thinks, admitting ‘I’ve lost count’. Nevertheless, Sandra remembers that in 1993, she began attending the theatre with her daughter. 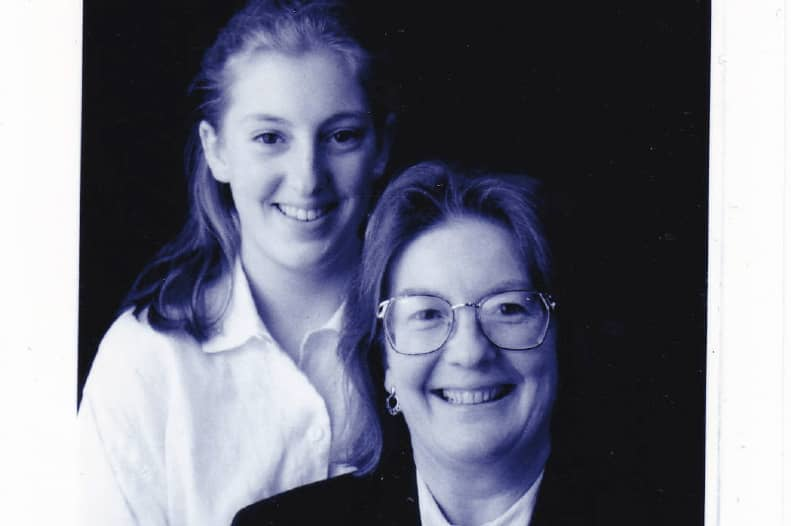 When Sandra’s daughter, Susie Robinson, was still at school, Sandra recalls attending an evening performance where a photographer approached them to take a photo to feature on the cover of the 1999 Season Brochure. ‘I have always suspected that our group were included because Susie and a school friend, who also subscribed at that stage, were probably the youngest subscribers there on the night – by about 30 years,’ Sandra said. Now, after 25 years of subscribing with her daughter, Sandra has dedicated a seat plaque in The Sumner to Susie as a birthday present and token of ‘something that represents our history – and future – with MTC’. ‘There comes a point in a person’s life when they have accumulated enough ‘stuff’ and have the means to buy more if they so choose. I wanted to gift Susie something important, memorable and unique; something with longevity,’ Sandra explained. As Sandra and Susie often sit in Row H, they chose Seat G8 for their seat dedication so they could appreciate the plaque from the row behind. ‘MTC has been an important part of our cultural life in Melbourne, [providing] an opportunity to come together once a month, reconnect and enjoy an experience that becomes part of our family history,’ Sandra said. Though a personal gift, evident in the chosen inscription, ‘SUSIE ROBINSON – WHO ALWAYS PREFERS TO SIT!’, Sandra and Susie are happy for other audience members to share in the joy of the message, hoping, ‘when other people read it, it brings a smile to their face’. Many patrons like Sandra may struggle to calculate their years involved with MTC, however Sandra and Susie’s story reminds us that the gift of performance is intangible, and sharing the experience of theatre with those closest to us is invaluable. Reserve your place in history or honour a family member, friend, group or company with a personalised name plaque on one or more seats in The Sumner. Learn more about naming a seat.